I may have a little problem when it comes to collecting vintage sewing machines. I just love their charm and utility, and I love both displaying them and using them whenever I can. One of my favourites is the Singer 221, the Featherweight, and this is one model that I always wanted to add to my collection after seeing collectors online posting their photographs. I needed the adorable lightweight machine to be mine. I told my husband about the machine and showed him pictures of what it looked like and what the case looks like. 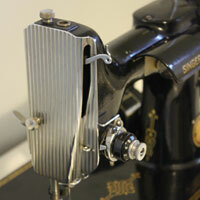 We go thrift shopping often, hunting for this and other beautiful or interesting vintage sewing machines. I may have gotten greedy, because now I have two Singer Featherweights. Thanks Justin! I’m so glad I have a husband who supports my crazy hobby. He is my enabler. I’m always interested in how people come across their machines, so I’ve decided to share how I came to own both of these cuties. My first Featherweight was found online and purchased from a Kijiji seller. (For those of you who are outside of Canada, it’s basically the same thing as Craigslist.) My husband picked it up for me for my birthday in 2015, visiting an older gentleman who collected all sorts of antiques. This Featherweight was in rough shape, with many missing parts, and we scored the machine for only $90. We suspect that it was originally used a parts machine and then sat stagnant. Over the course of the next few months, I ordered in most of the missing parts (mostly from April1930’s Singer Featherweight Shoppe). Most significantly, the belt, the spool pin and bobbin case were missing, essentially making the machine inoperable until we gathered them. Once we gathered them and got them all installed and in place, we oiled the machine and attempted to fix a major issue with the timing. We weren’t able to fix it, so after a few months, we gave in and took it to the Singer store for servicing, and now it runs so nicely. I was really hoping we wouldn’t have to get it serviced, but it was worth the cost to me. We’ve mostly got this up to ship-shape. We need to add the missing spool winder at the bottom but it works fine without it for now. Additionally, the base of the bed is slightly off kilter. Sometime in its life, it was bent a little at the base. Justin is going to try to bend it back in place at some point. 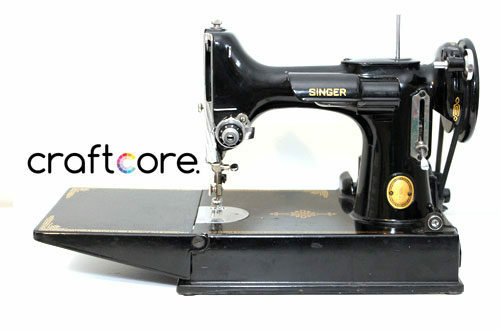 Since we were able to find our own Featherweight, the hunt for this machine obviously cooled. However, I still love thrifting for sewing-related goodies. Our wedding anniversary is today, and to celebrate, we traveled to Niagara Falls the past weekend to attend a comic book convention. We decided that on the way home, we would hit every Value Village thrift shop that was easily accessible from the highway. Such fun! On Sunday, we ended up visiting six locations, driving through an off-and-on combination of a gorgeous sunny skies and torrential downpours. The weather was weird, and this is a critical component to this story. In Hamilton, my husband spotted the tell-tale black case at the front of the store with the specialty showcase items. I’m telling you, I have the image of that case ingrained into his brain forever. We ran over to it, pulled it off the shelf, and ooh’d and ahh’d over the Featherweight that was in arguably much better condition than the machine that we already owned. Although the case was in very rough shape, we had to have it! As we pulled out the machine, another woman exclaimed with excitement what a great machine that was. We did not want to walk away as she kept eyeing us. Ouch, this Featherweight case has definitely seen better days! We are going to try to repair it. Plot twist: The power went out in the thrift store. No! The store was completely dark except some low emergency lights, so I used my cellphone to examine the machine further. Yes, we definitely had to have it. All the parts seemed to be there, except the bobbin case. 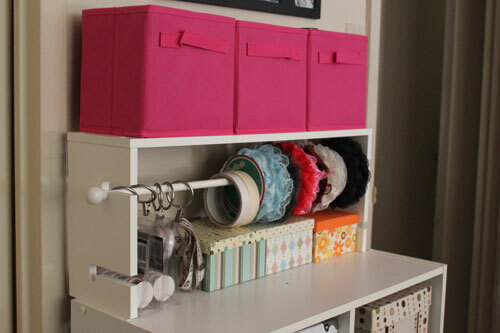 Seriously, what do people do with their bobbin cases?! I store all mine in the machine they come with. I want to believe potential customers aren’t stealing them! The staff of the store ushered us all to the front of the store, and I was happy that the showcase items were already at the front so we could keep the machine in sight. We all stood around, waiting for the electricity to come on. The other woman who was interested in the machine was standing by it, poking inside the case, and I was getting very nervous. She was eventually ushered along as well and we kept our eye on it. After about 15 minutes, the manager told all of the customers that we would have to vacate the store because the electricity wasn’t coming back anytime soon. Anyone in line had their name and phone numbers taken with their items. We hadn’t made it to the line yet, but we asked the manager if she could please take our information as well and hold the machine for us. We waited outside the store in the rain for a while, but the odds were against us, and we eventually had to leave to travel to our next location. As we drove along, we called back the store periodically, but it never reopened that day due to the electrical issue. Hamilton is about an hour and a half away from where we live, so it was a bit of a drive to get back out there. But on our anniversary, we trekked back out for a second road trip and picked up our machine. The tag was marked as $129.99, but we chatted with the manager and were able to receive 20% off the ticket price due to the trouble and due to the machine missing the bobbin case and the condition of the case as well. 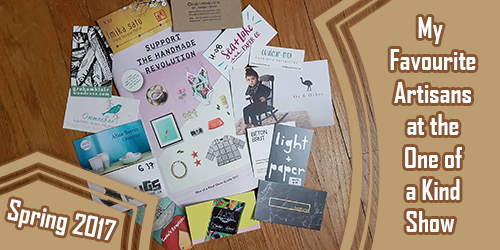 On top of that, we also had a 30% off punch card, so at the end, we rang up at $72.79 – not bad for a Featherweight! Here are the details regarding my two machines. 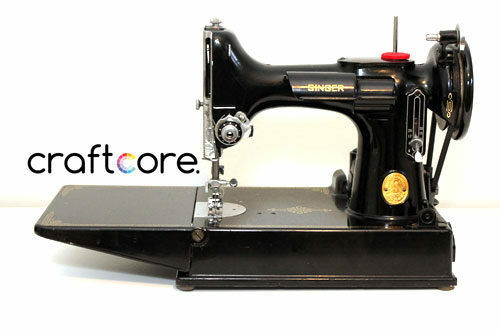 If you have a Featherweight and are interested in dating your machine, you can find info on the Singer Co site regarding the serial numbers. This is how I found out where my machine was made and its year of production. 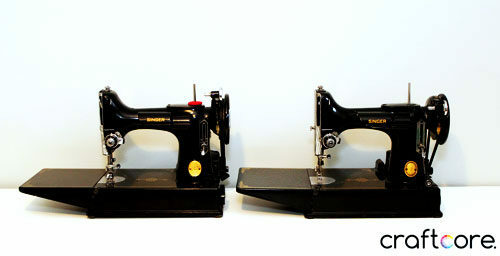 Both of these machines are in working condition and produce a great stitch. Whoohoo! Motor Notes	 Although the serial indicates that it was made in the USA, the motor itself is made in Canada. The Singer logo on the motor is the signature Singer "S", in red with gold a gold outline. 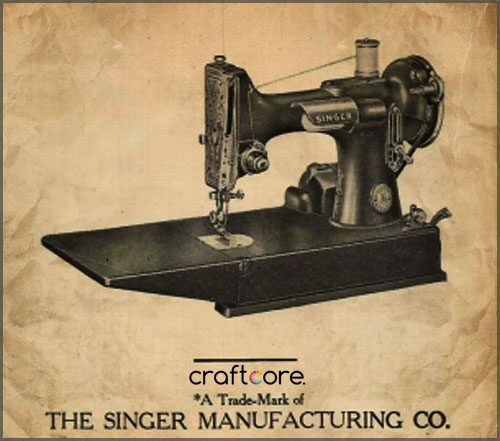 Within the S, it says "Singer Sewing Motors." Although the serial indicates that it was made in the UK, the motor itself is made in Canada. The Singer logo on the motor is the signature Singer "S" in red, with no additional markings. Cosmetic Differences	 • The badge on the neck of the machine is gold only. 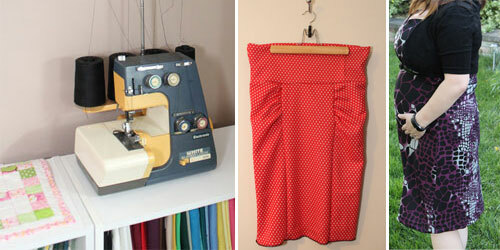 • The bobbin winder is a slightly different shape than my other Featherweight. 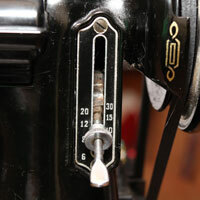 • The stitch length selector has a black decal / paint applied with painted-on numbers. It's not engraved. There is a border of silver-coloured metal plate peeking out. • The gold decals on the bed of the machine are slightly more subdued than my other Featherweight. 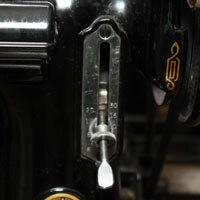 • The badge on the neck of the machine is gold with a black decorative border around the perimeter. • The stitch length selector has no decals applied and has the numbers engraved directly onto the silver-coloured metal plate. Next Steps	 • I'm missing the bobbin winder at the base of the machine. 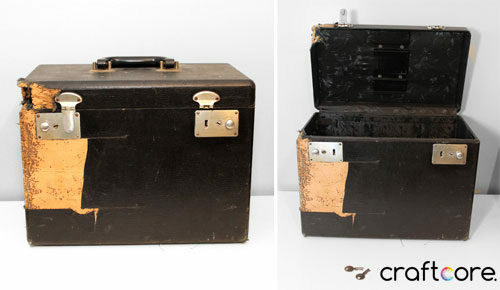 • Nice to Have: Featherweight case, if I can stumble across one. • Repair the base so that it's completely flat. • I need to purchase a light bulb. • I need to repair the Featherweight case. • I need to repair the foot pedal. This is so cool! I sew with just a regular old, mother-in-law-bought-it-at-walmart, no fancy gadgets or vintage charm sewing machine (it gets the job done) but I love the vintage ones. I’ve got a friend who has a family hand-me-down vintage sewing machine that actually lives in a vintage sewing table (you can pop it up or hide it away in a little cubby) and it is the most charming sewing machine I’ve ever seen. What a wonderful story! I just acquired my first Featherweight. I paid a little more than you, but not by much. 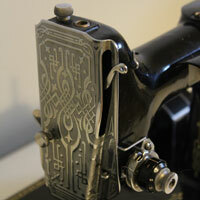 She is the crown jewel of my collection of 17 vintage machines. 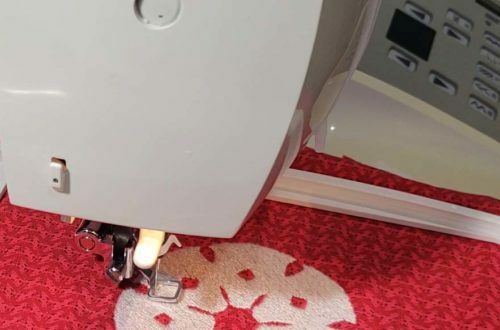 Once the vintage sewing machine bug bites, it never lets go! My husband loves collecting these vintage ladies as much as I. He does not sew, but he likes the thrill of the hunt and he enjoys restoring these ladies to their former glory. I love the story that comes along with each machine. I get to know their former owners. I love feeling connected to stitchers of the past. I love their quality, their simplicity, and their uniqueness. Each one has a soul. Each one has a unique character. Each one brings me hours of joy. I gave up on modern machines with their plastic casings and their soulless character years ago. 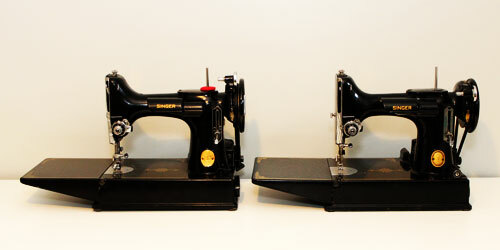 I invite you to meet my sewing family at https://saskatoonstitcher.wordpress.com/2016/06/16/vintagesewingmachines/ . Hi Bonnie! 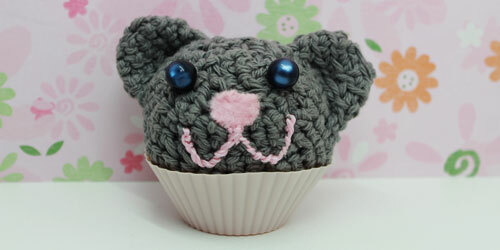 Thanks so much for sharing the link to your collection! I’ve loved reading the stories behind your machines too!